You are currently browsing the category archive for the ‘CO2’ category. It’s time I put this in perspective. Here are the news feeds. A Different Romney Wins The Debate. Coupled with the opinion polls, what is happening is very obvious. Americans support Democratic middle class values, they abhor the wing nuts of the Republican Party. It is not coincidental, that the last two Republican presidential candidates were the ones with the most LIBERAL credentials. Because America accepts those credentials. What America rejects, is slash and burn Conservative policies, that require no personal freedoms to individual Americans, whether it is economic, vaginal, religious, or political. Everyone is expected to conform to a very narrow norm. So we now have a Republican who did exactly what he said early during the primaries. He shook the Etch A Sketch and is now running as the Liberal Governor of Massachusetts. “I will not give a tax break to the top 20%. There will be no tax cut on the top one percent. I will not get rid of Roe versus Wade. Abortion is here to stay. I will not put religion into government. Government is Government. Religion is Religion. I will not nuke Iran. I will not cut one penny from government spending. I will support the rapid growth of wind farms and solar energy. I will not cut 716 million from Medicare, even if it IS in my economic plan. I never proposed $5 Trillion in Tax cuts. I will not cut spending. I will raise it by 2 Trillion Dollars. Government is too small. I will grow government to make it better. I will not stop women from getting abortions. I will not stop the removal of God from government…. These were all in the debate. It was a different Romney speaking. Why? Because as a conservative he was losing. As a conservative he was out of touch with America. As a conservative HE WAS IN THE MINORITY WITH MINORITY VALUES. As Conservatives long expected, Romney is a liberal. They know it. Really? How does anyone expect a Mormon to support Pat Robertson and the 700 Club? You do it out of expediency; not a genuine shared system of belief…. But the point of this is not about Romney. It is about Conservatism. Conservatism fails, and simply for that reason alone, it is not upheld by a majority of Americans. Which means, to win, one has to be a Liberal Republican… Just look at the polls. As soon as the Liberal Romney comes out of the closet, the polls get real tight…. But, as we saw with Bush W. You may run as a Liberal, but when you get in, it’s the Conservatives who take over. Two wars, a pharmacy company bailout, and regular government operation, all which were financed by our grand children’s future payroll deductions. They get to make less money so today’s Republicans can take it all. In other words, to be a Republican President, you have to “trick” yourself into that position. So, America, I know it sounds nice now, but over and over and over you have said, no that is not what we want. What we do want, is someone who will do what we want, when they get into running America. let’s take the last president for example. Obama got us out of a recession in record time. One that was far worse than the Great Depression to some extents. Obama saved the American Automobile Industry. To do so he had to drive hard bargains against all parties . Obama killed Osama Bin Laden. America got what it paid for when they voted Obama. Why change horses in the middle of the stream, especially when the other horse is heading back in the other direction? The wrong direction according to almost all Americans? Romney knows that backwards direction leads to ruin. That is why the new Romney pushed the campaign message- minder outside the inner circle, and why Romney is now currently running for women’s rights. for the secularization of government, for the complete protection of the environment, for the elimination of greenhouse gases, and for the increase of taxes on the wealthy. That is why Romney is doing better in the polls…. It is hoped that the prospect of the White House taking action could push Congress to come to an agreement. In the post below, I posted Delaware’ CO2 emissions from the year 2006, as compiled by Delaware’s Energy Office. These corporations will no doubt suffer some economic ill effects if Carbon Taxes go into effect..
That is how this must be seen… As long as your total health and energy bills combined, do not grow, you are holding at the same level… If total of both grow, you are worse off; if the total of both drop, you are better off…. That is how Carbon taxes must be viewed..
Now those who actually read Chapter 4 of the Kavipsian Theory of Economics, already know how Carbon Taxes benefit the United States economy… You know who you are..
For the rest of you, here is a refresher…. On the global scale, Carbon taxes will be levied as are tariffs today… For instance, if the United States refuses to sign on to the Carbon tax arrangement, then those other countries buying our products, tack on a tariff to cover the Carbon tax we did not collect.. That makes our products as high or higher than those of other nations…which on a global scale, hurts us economically. On the reverse, if we enact a carbon tax upon our power plants and other sources of carbon, then we can trade with other nations doing so because our tariffs cancil out.. We don’t pay an excess.. Our prices are more competitive.. If you were an investor, doing manufacturing within the United States, now appears to be cheaper than offshoring all factories.. What’s the point, when the economic advantage of manufacturing offshore, has just been negated? And it does all this, while dropping our medical bills at the same time…. How Clean Is Your Air, Delaware? Carbon Caps will Drop Our Rates!…..Eventually….. The Senate will decide this week whether to follow in California’s footsteps and pass legislation requiring cuts in U.S. greenhouse gas emissions to combat climate change. Lawmakers are set to vote Monday to begin debate on a bill that could reshape the U.S. economy by requiring industry to pay to emit carbon dioxide and other heat-trapping gases. Opponents call it a new tax on industry that could raise gas prices and energy bills for consumers. Now before I knew anything about wind power coming to Delaware, I would be apprehensive about taxing carbon and “increasing the costs to power plants, distributors, and consumers……. But knowing what I now know, that all carbon prices are about to go ballistic as did our automobile and truck fuel, the faster we leave a carbon based economy, the faster we will pull out of this recession. Wind, particularly offshore wind, if built large enough is the cheapest form of energy available to us today. If solar improves to where it crosses the 10 cents/kwh barrier, it too can become a player…. There is enough wind power capacity in North Dakota to fuel the entire grid of North America….. The financials show it could be done today for 2.3 cents per kwh… Imagine, all of the US energy needs met at 2.3 cents per kwh. Your $200 monthly electric bill would instead be $40 dollars. Which is right about where it needs to be……. But not all the wind needs to come from North Dakota, even though it has tremendous potential……Up and down the Eastern seaboard, giant wind farms could drop our prices and save on long distance transmission costs…. From Texas to North Dakota, the wind belt could drive America’s mid section energy prices down to a tolerable level…..
By dropping worldwide demand, we could stop our dependence on energy coming from the Mid East. Being the sole planetary source of 2.3 cents per kwh of electricity, our manufacturing base could again begin to grow in places where it once walked away from union labor……Ohio and Michigan. What automobile company could pass up savings of 20 cents per kwh over what the paid in their home country? Back to Carbon caps and taxes…..Taxing something that is bad for you at a rather high rate, is ironically a very good thing. It forces you to wean yourself off its toxic properties and seek another solution. It does so expediently. Forcing you to move quickly before your money disappears..unlike a government directive facing appeal after appeal after appeal……. And if timed right, it won’t cost us a penny. For paying a million dollars for a kwh of coal fired electricity is moot, it there is no kwh of coal fired electricity left to be taxed…. …..
Today I had the privilege of traveling through time. Not physically, but my travels were done in a way that was both metaphorical and symbolic. They led me through a time warp. My path took me up a hill to a nearby wind farm, whose turbines were owned by FLP. Even underneath its base, there was no grating noise, only a minute squeak after every 5 revolutions. The hilltop had been cleared, allowing for a maintenance road to traverse the ridge line. On two distant ridges I saw more rows of turbines turning. 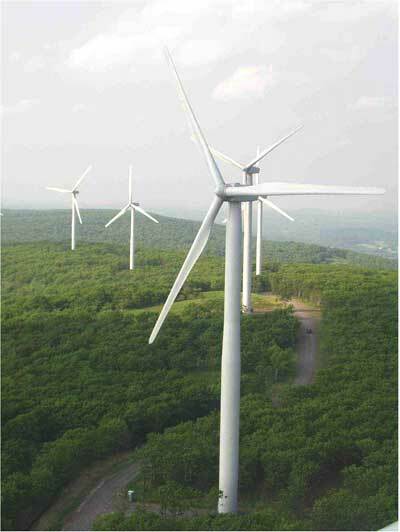 The city of Meyersdale, PA was surrounded by wind turbines. On the way down, a narrow two lane road, I passed a double horse buggy, of man and wife headed across the mountain. I had often wondered how pioneers had navigated mountains with horse pulled wagons, and now plodding up the hill towards me, I saw it could be done. Thinking I wanted to talk, (my window was down due to the springiness of the weather) he stopped his horses on the 5% grade, and feeling bad for what I had caused him to do, I traded pleasantries with them. Pulling away I saw the horses start their walk up the steep hill, probably grateful for the brief minutes rest. Now there is a self sufficient community that will not feel the crunch caused by the rise in energy prices, nor feel the inflation of high food prices caused by the rapid devaluation of the dollar. Plus any of their surplus items sold from their farms, should fetch a fair penny, too. And we and weird Al Yankovich use to think they were living in the last century, and not the next one……..
Later while on my drive a news station brought up the Iranian oil and gas crises. The crises is not with the Iranians. It is with the United States which after having vilified Iran and will now receive none of the abundant cheap energy that Iran has now to offer. China, India, and Europe are extremely interested in Iran’s natural gas, to such an extent that a 5 billion dollar pipeline will eventually stretch from Iran through Turkey, the Balkans, Hungary, and into Western Europe. This will give Europe a hedge against the Russian propensity to shut off their gas lines whenever the West practices politics the Russians do not like. In the other direction a pipeline to India and China will give those two giant energy starved nations the source of energy they need. The bad news is that gas will be available to other countries, but not us…..The fear is that we will be left with no choice but coal. Dirty coal will burn and give us our electricity. Unless we forswear off fossil fuels altogether. Wind is a valid source. So is solar. These two sources together could theoretically power our nation’s entire grid, with ample investment. What if we let the rest of the world fight over carbon sources, while we go green and clean, cheaper than our competitive nations could with coal or gas? Eventually they too will be forced to seek out our technology. Electric cars are the best bet for the future of automobile travel. Plug into a grid supplied by renewable sources of energy, release, and drive. Neither pollution, nor CO2 would be released for either our principle source of power or our transportation. With electric cars, will still be able to afford to drive, while the rest of the world idles their cars until they catch up to our technology. They have to; they will have no choice when gasoline shoots to 25 dollars a gallon. As one hears how much global demand for gas, coal, and oil is expected to rise, ( look at China’s growth the last ten years and apply that to India, Africa, and South America) it is imperative that we aggressively work to abandon our dependance on all carbon fuels. The establishment of Delaware’s wind farm off of Rehoboth Beach, is certainly a cheap step in the right direction. We know there will need to be many more wind farms up and down our coastlines, if this nation is to remain solvent. Delaware’s expertise at building a wind farm off U. S. shores, can boost our local economy beyond anything we have seen up to this point.